Capt. 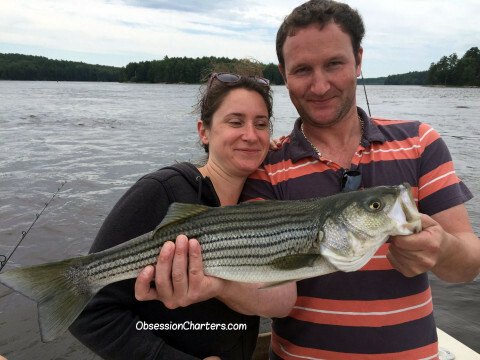 Dave posts his recent Maine fishing reports. 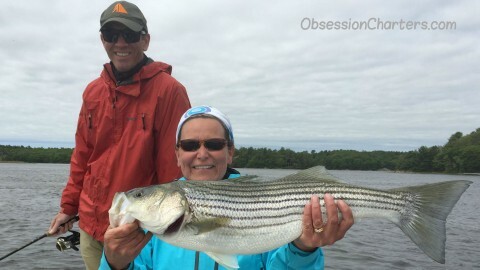 We picked up a good bit of internet and social media exposure in Orvis' Blog: the Orvis News with a story titled "A Striper Morning on Maine's Kennebec River" Check it out and share it. 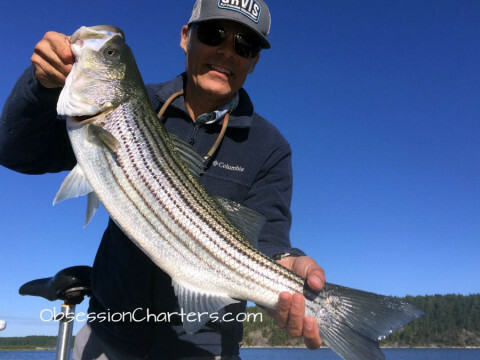 It talks about the fantastic striped bass season we are having and the reasons why its happening. 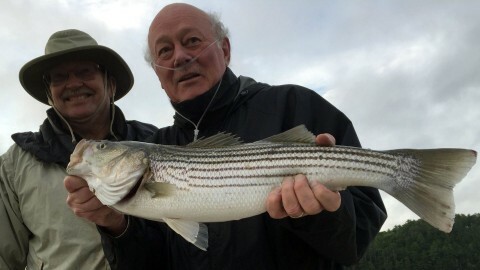 Conditions: We are seeing some of the very best early June striped bass fishing in years. Lots of surface blitzes on both the incoming and outgoing tides. Water temp is between 60* and 67* and water clarity is good. 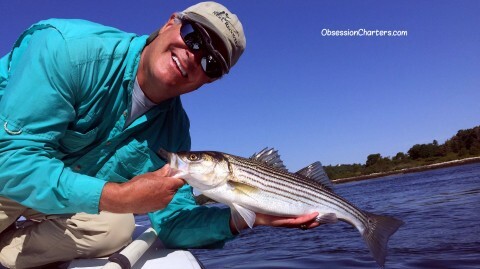 20kt Northwest winds gusting to 35 and a sky rocketing barometer made for an interesting day on the Obsession. 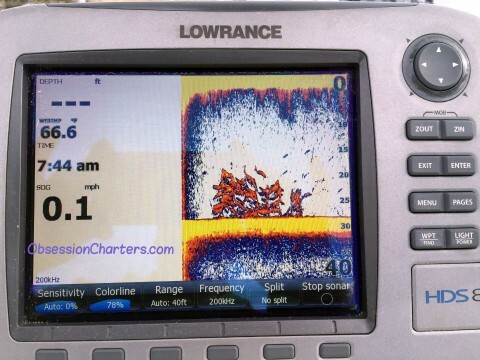 Got to the boat an hour before my clients to find a school of striped bass feeding like piranha around the docks (check out the sounder screenshot of the fish stacked up under my slip. ​So what was I to do? 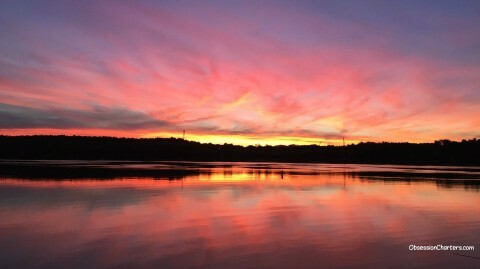 Break out the 9wt fly rod and a folded foam popper! Went 9 hook ups for 10 casts and then decided I better get the boat ready. My three clients showed up and I did something I rarely do - I suggested they make some casts right there in the Marina. 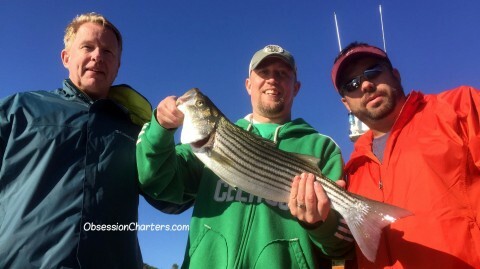 I assured them we were going to cast off and fish elsewhere on the Kennebec. 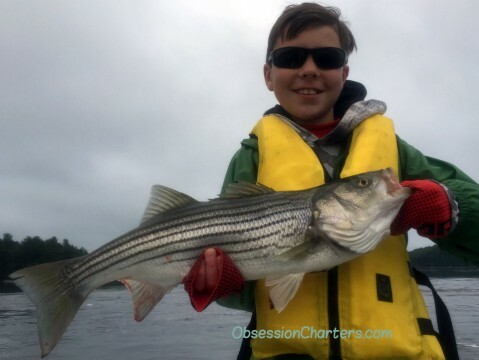 After they caught and released several stripers we did just that. 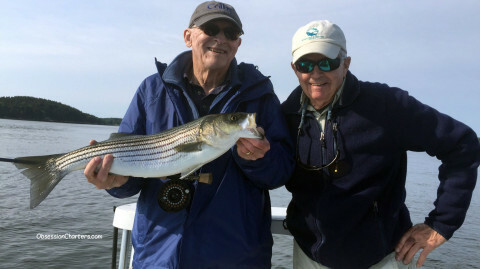 ​Thursday morning proved to be the best kickoff to the striped bass season in many years. I was part of a four boat outing for folks from Sunday River Ski Resort. 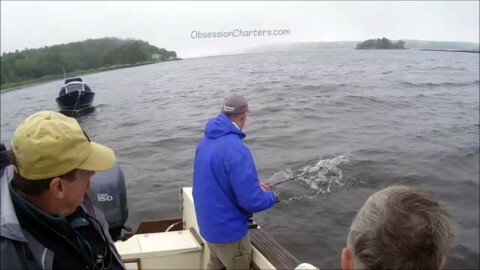 We had fish busting on the surface for two solid hours. Mostly schoolies but we managed to get two nice 8-10 pounders too. 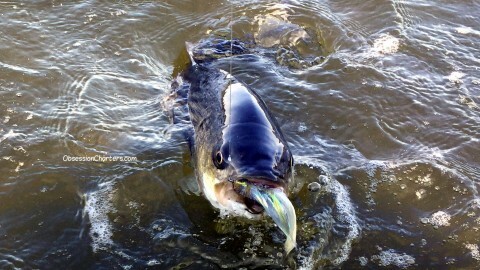 There's tons of small and medium sized river herring around for the bass right now. 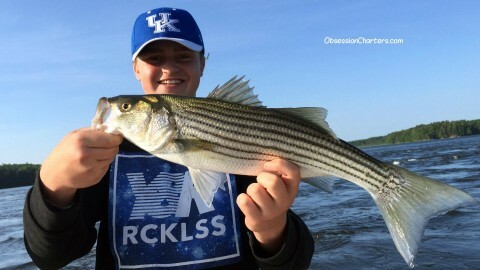 We caught them on light tackle using MirroLure twitch baits, sluggos, and bucktails. Video coming soon. I've got June dates available - lets go get em!